correct person? or Did the Evil Witches take out the nurse? We can't get a majority for a lynch and in the night, the witches are failing to do their work as well. Im disappointed and discouraged. MY VOTE IS FOR ZACK. 3rd times a charm right? I agree Amanda, ZACH gets mine too. i will go ahead and vote Zack too. I'm voting for Zack too! How are we going to know anything, if we can't get someone out? I am voting Zack as well . Its the only way i will find out if you are a witch or not . 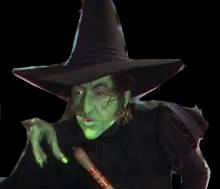 You have eliminated The Wicked Witch of The West!!! Congrats Investigators you are now one step closer to saving everything!!! Deadline for night round is Thursday at 8pm EST, Nov 3rd.